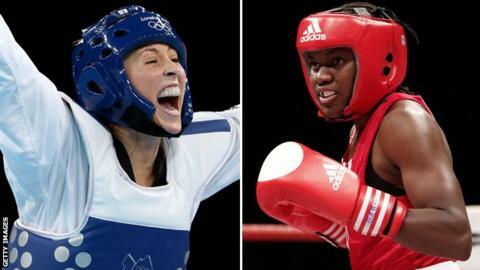 Taekwondo fighter Jade Jones and boxer Nicola Adams both won Olympic gold medals at London 2012. Coverage: Reports and select video highlights on the BBC Sport website. Olympic champions Nicola Adams, Jade Jones and Ed McKeever will lead Great Britain into the inaugural European Games in Baku, Azerbaijan. They are part of a 163-strong GB line-up which will compete across 13 sports and 19 disciplines from 12-28 June. For 10 disciplines, including boxing and taekwondo, Baku 2015 will form part of the qualification process for the 2016 Rio Olympics. "It's a great opportunity," said Team GB's Chef de Mission Mark England. "Many will test themselves against Europe's best, gain crucial multi-sport Games experience or build on their road to Rio 2016." The sports Team GB athletes are competing in with Olympic qualification possibilities are: archery, beach volleyball, boxing, judo, shooting, swimming, table tennis, taekwondo, triathlon and wrestling. Baku 2015 is the first attempt to create an elite-level multi-sport continental competition in Europe and is similar to the Pan-American and Asian Games which have been running since 1951. "I have a very good track record in multi-sports events and I hope this will be useful preparation for the Olympics in Rio next year," said flyweight boxer Adams. Taekwondo fighter Jones - winner of Olympic and Youth Olympic gold medals - added: "I'm sure that the European Games will prove to be another memorable experience." Team-mate Lutalo Muhammad, who won taekwondo bronze at London 2012, takes the -80kg berth originally assigned to Aaron Cook before his defection to Moldova earlier this month. Baku 2015 is backed by the European Olympic Committee and is the first-ever elite multi-sport continental competition to be held specifically for European nations. The Games will feature 20 sports (16 Olympic, four non-Olympic) and more than 6,000 athletes. There will be 253 medal events - and opportunities in 12 sports to qualify for next year's Olympics in Rio. It is hoped that future Games will feature elite level athletics and swimming events. The 153 named athletes and additional 10 male boxers, who will be revealed in the coming weeks, form the largest British squad sent to an overseas event since the 2008 Beijing Olympics. Other notable leading British athletes include silver medal-winning judoka Gemma Gibbons, three-time world triathlon champion Helen Jenkins and English Commonwealth gold medallists Nile Wilson (gymnastics) as well as Steven Scott and Charlotte Kerwood (shooting). Wilson missed the record-breaking European Championships for British Gymnastics this month due to injury, but hopes to challenge for honours in Baku. "It's massively exciting for me, not just the fact it's a huge multi-sport event, but it's my return from a serious wrist injury," said Wilson. "I can't wait to get back out in the competition arena." In addition to the Olympic events, Team GB will also field competitors in the non-Olympic aerobic and acrobatic gymnastics competitions.